Draw polygons on google maps to select properties in your real estate client management solution! New Ways of Winning in Real Estate! NEW: Draw Polygons on a Google Map to select properties! Properties are pinned on maps with latitudes / longitudes which means you should be able to search on the map. How cool and useful would it be to simply draw on a map to make your selection(s)? 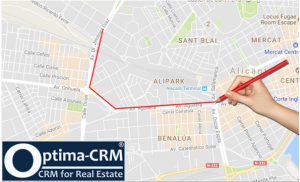 Well now you can using our Real Estate Client Management solution Optima-CRM! Simply draw a polygon on a Google map and instantly select the properties within that/those polygon(s). It works for property searches as well as defining the areas your client is interested in and instantly show all relevant properties. To save you even more time, the map conveniently opens directly on where your agency is located (or where you define it to centre on)! If you are excited about these features and want to make use of them yourself too, feel free to contact us for a free demonstration and we will show you how it works! If you have any suggestions or ideas you can also send these any time you want and we will try to work these out for you, so you can have the best experience possible!